Moving to its next major target, Volkswagen has confirmed that it plans to make a run at the single-lap record for a fully electric racing vehicle at the Eifel's Nordschleife racetrack. After smashing the old Pike’s Peak “Run to the Clouds” record by a full minute, VW has a new target for the potent ID. R, the carmaker’s first fully electric sports car. This time, VW’s goal is nothing less than one that might be considered legendary, the Nurburgring-Nordschleife lap record for electric vehicles. Romain Dumas is slated to be at the wheel again for the run at the electric car lap record. 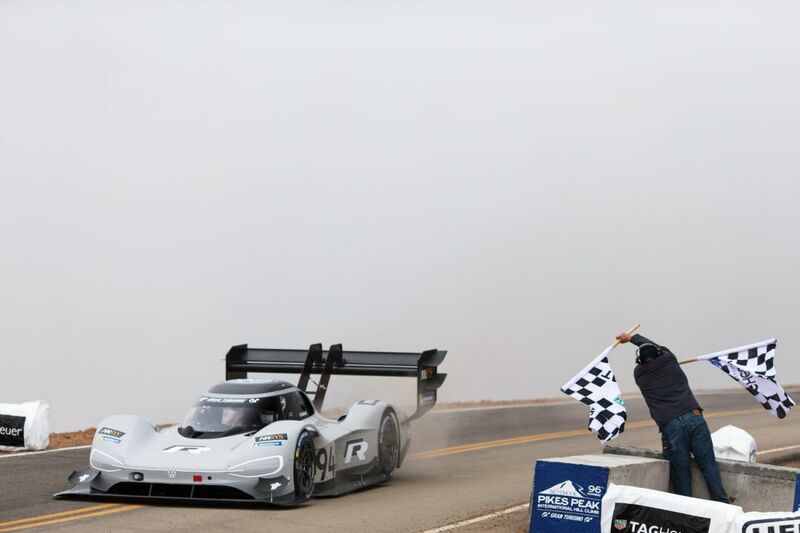 He was the winner of the Pike’s Peak International Hill Climb in June 2018. Also known as the “Race to the Clouds,” Dumas’ record of 7:57 is the first time in a century that a vehicle did the run in under 8 minutes. No stranger to the Nurburgring, Dumas has four wins in the 24-hour enduro at the ‘Ring. The ID. R faces further development so it can make the run at the record. Already, lightweight – it weighs less than 2,500 pounds, driver included – it is also powered by two electric motors, whose combined capacity is 670 horsepower. With this type of power available, it is apparent that the development has to be on the aerodynamics. “Above all,” says Francois-Xavier Demaison, VW Motorsport’s technical director, we will modify the aerodynamics of the ID. R in order to cope with the conditions of the Nordschleife, which differ greatly from those of Pikes Peak.” For example, Pikes Peak starts at an altitude of more than 12,000 feet, ending at 14,115 feet, while the Nordschleife winds its way through the Eifel at between 1,050 and 2,024 feet above sea level. Among its unique characteristics is the very long Dottinger Hohe straight. The developers are accounting for this and other individual parts of the track. “As part of our meticulous preparations for the record attempt, we will put the ID. R through an intense test and development program at various race tracks in the spring,” Demaison added. Volkswagen plans a run at the record during the summer. Dumas is excited by the new challenge. “The thought of driving the ID. R on the Nordschleife is already enough to give me goosebumps. I know the track very well, but the ID. R will be a completely different challenge, with extreme acceleration and huge cornering speeds. I can hardly wait for the first tests,” the driver said. “Breaking the existing electric record will certainly not be a stroll in the park,” Dumas continued. The current record for fully-electric vehicles stands at 6:45.90 minutes – at an average speed of almost 115 mph. It was set two years ago by Peter Dumbreck of Britain in an NIO EP9. The Norschleife opened nearly a century ago. Comparatively narrow, the 13-mile-long track is one of a kind. The course has no fewer than 75 corners as it quickly climbs or descends through the forests of the Eifel. It continues to serve as an excellent test environment for the car industry. Racing legend Jackie Stewart once respectfully called the circuit the “Green Hell.” And, despite repeated modifications, the venue has not hosted a Formula 1 event in more than four decades. Today, the Nordschleife – together with the modern Grand Prix Circuit – is primarily known as the venue for the famous 24-hour race. The FIA World Touring Car Cup (WTCR), a global touring car series, also visits the road course in the Eifel Mountains. Volkswagen has a representative in each with the Golf GTI TCR.